Max 3GP PDA MP4 Video Converter is super-powerful and easy to use software to convert Video to 3GP, video to PDA, video to MP4 formats, which can convert AVI (DivX, XviD...), MOV (QuickTime), MPEG (MPEG-1, MPEG-2), MPG, WMV/ASF, WMA, DAT, MP4, 3GP…to 3GP PDA MP4 formats. Max 3GP PDA MP4 Video Converter enables you to put your favor move and love music on 3GP,mp4 player,personal digital assistant.In this way you can enjoying it without the restrict of time and place. 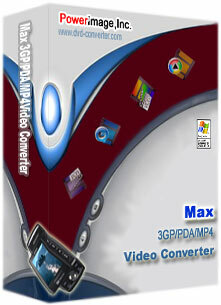 It isn't a surprising for you to find that Max 3GP PDA MP4 Video Converter is integrated one with super speed and high quality, compare with other 3GP converter, Max 3GP PDA MP4 Video Converter has more settings you can customize, for instance, convert 3GP video by custom volume of file size, select video formats, resolution, quality, and audio channels, quality, Frame rate is selectable. Max 3GP PDA MP4 Video Converter famous of fast and easy to use, just a few clicks is enough to have a try now as well as you can get this full-function software at a very competitive price! Add built in H263 MPEG4 video encoder and decoder. Add pre-defined output format for 3GP 3G2 and MP4. Support Input file format of avi divx xvid to 3GP PDA MP4. Support Input file format of MPEG1 MPEG2 to 3GP PDA MP4. Support Input file format of MP4 MOV to 3GP PDA MP4.